Timely planning, good inter-agency working relationships, and leaning on technology helped the city of Ventura and Ventura County in their response to the 2017 Thomas Fire and subsequent wildfires. A dedicated website can be vital during disaster. A common communications platform can facilitate discussions in an emergency. Working together and having previously established working relationships can make response seamless. Collaboration and an emphasis on technology have been key to helping two local governments respond to one of the state’s most notorious, ongoing natural disasters — wildfires. • A dedicated website was instrumental. City and county each had a significant online presence when the fire began Dec. 4, 2017. But Ventura County Public Information Officer Bill Nash and former Ventura Interim City Manager Dan Paranick said standing up a separate website dedicated specifically to the fire and recovery was key for their agencies. Hosted by the county but with the city taking an administrative role, the website went live within days of the fire’s start — and both agencies linked to it from their own websites. “If you can stand up a single point of contact for the public in recovery, that’s helpful,” Paranick, now district manager of Rancho Simi Recreation & Park District in Simi Valley, told Techwire. 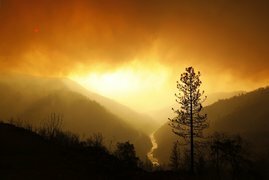 “The first thing people want to do is go home, and we wanted to make sure they had the information they needed to go home,” Nash told Techwire, noting that the website documented immediacies like downed power lines and evacuations, but evolved to include information about handling ash. • That same website is still active more than a year later. County officials archived Thomas Fire information and refocused the site to aid victims of the 2018 Woolsey and Hill fires, Matt Carroll, Ventura County disaster recovery director, told Techwire. “Having that model and that infrastructure allowed us to set the new one up within hours,” Carroll said. • Standardizing or unifying communication platforms can be helpful. Paranick said timely communication between first responders and those managing an incident is essential and can become challenging when officials aren’t on a common platform. However, during the Thomas Fire, he said this wasn’t a big issue. • Having access to GIS data during a disaster can be a big timesaver, the former interim city manager said. During the Thomas Fire, Ventura city officials utilized GIS to prioritize their responses, and to log information from the field about nonworking water lines or downed power lines. • Collaboration proved vital. Paranick was named interim city manager on the night the Thomas Fire began. The new leader worked 36 hours straight; and in an interview with Carlee, said the combined response’s “most important parts” were organizing at the beginning and defining roles. The morning after the fire started, city and county officials quickly met to plan and discuss how it would be extinguished. “Making sure that those relationships are strong and workable on a day-to-day basis is really critical when something bad happens,” said Carlee, who also emphasized the “importance of having a robust IT response for providing basic IT infrastructure” during a disaster. Carroll called city-county teamwork a “true partnership” with both agencies taking part, alongside a host of first responders, but no single leader.